Challenging questions ranging from a chub to a Trump. The Picture Round is Date the Famous Albums and the Wild Card is a Box Office fact on that eighties classic movie Top Gun. Q03. What sort of creature is a chub? Q12. Which British singer told Donald Trump to stop using her songs at his presidential election rallies in early 2016? Q27. In the sport of Horse Racing how many years old is a filly before it is officially classed as a mare? Q32. In the 2001 film Moulin Rouge which singer made an appearance as The Green Fairy? Here’s a low-res sample of the Date the Albums Picture Round, click for a higher resolution version. The Picture Round download is a two page high quality PDF with the answers on page 2. 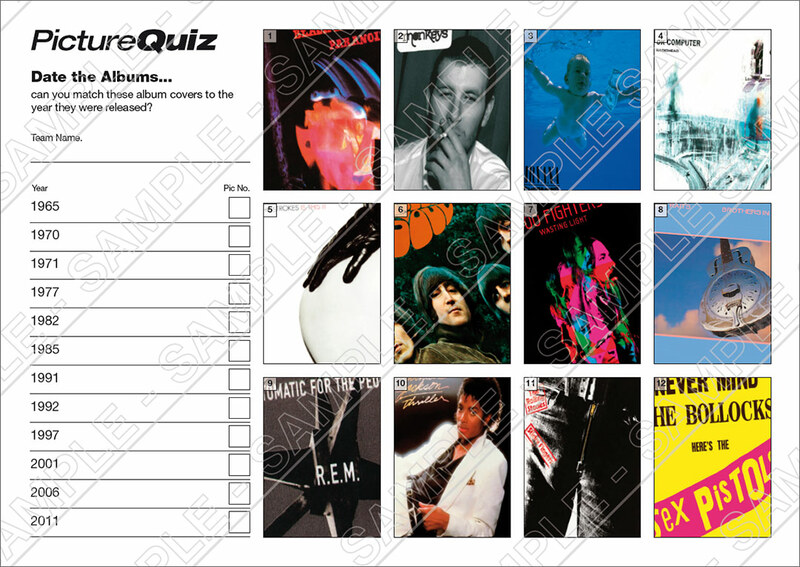 Quiz number 063s Picture Round is can you match the Albums to the year of their release. The Wild Card Question for Quiz 063 is a Box Office stat on that classic 80s blockbuster Top Gun starring Tome Cruise.